Performance Whey Protein with Whey Protein Isolates +Magnesium. High Quality Advanced Formula For Those Following Intensive Exercise and Training Regimes. Whey is isolated from milk and is recognised as an easy to digest, high quality source providing an excellent mix of amino acids, including high levels of the three branch chain amino acids (BCAA's). Amino acids are the essential components of protein. Protein contibutes to the growth and maintenance of muscle mass. Our whey protein powder also includes magnesium which can help contibute to the reduction of tiredness and fatigue. Lamberts make a point of describing the nutrient levels in all of their products both honestly and accurately. This means that if you are comparing this product with the other whey brands, you may find differences. Most of these will arise because some manufacturers try to make their products sound more technical than they really are. This is one of the highest quality whey products available and is manufactured in the UK. Whey protein isolates have been added to boost the overall level of protein. Alanine - 1.0g, Arginine - 0.5g, Aspartic Acid - 2.4g, Cysteine - 0.4g, Glutamic Acid - 4.0g, Glycine - 0.4g, Histidine - 0.4g, Isoleucine*/** - 1.5g, Leucine*/** - 3.0g, Lysine* - 1.8g, Methionine* - 0.4g, Phenylalanine* - 0.7g, Proline - 1.2g, Serine - 1.14g, Threonine* - 1.5g, Tryptophan* 0.5g, Tyrosine - 0.6g, Valine*/** - 1.5g. Whey Protein Blend (Whey Protein Concentrate (Milk, Soy) , Whey Protein Isolate (Milk, Soy)), Branched-chain Amino Acids (L-Leucine, L-Isoleucine, L-Valine), Flavouring, Magnesium Citrate, Stabiliser (Xanthan Gum), Natural Colour (Beta Carotene), Artificial Sweetener (Sucralose). SERVING GUIDE: Mix one slightly heaped scoop (30g) with 250ml of cold water or skimmed milk (for the smoothest result, use a blender). 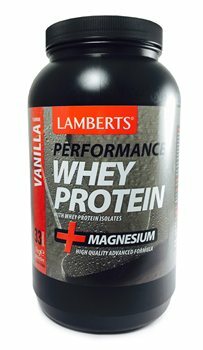 Lamberts recommend 1-4 portions per day depending on your protein requirements. Take at any time in the day to boost your total protein intake. If you mix with skimmed milk you add an extra 8g of protein, plus 85 calories. Take as above or as recommended by your practitioner or pharmacist. Do not take if pregnant or breast feeding.